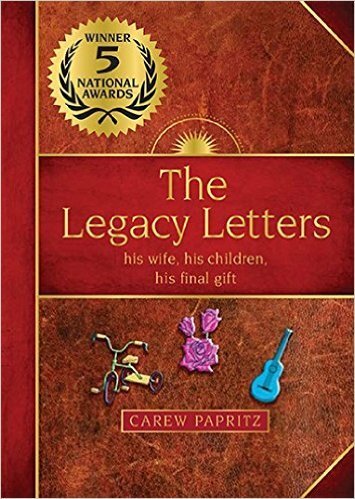 Early on in the book, "The Legacy Letters," Carew Papritz recalls the most fateful time of this family's life (who chooses to stay anonymous), revealing, in some of the details, what seems to be a striking attunement to her husband's legacy. Two people deeply in love find themselves no longer seeing eye-to-eye. For this reason, they choose to separate. Shortly after leaving she found out she was pregnant with twins, but from the anger stemming inside from their separation, she chooses not to share this information with him. It was at this very moment their life took a turn for the worst. Tragically, her husband found out that he was terminally ill and had heard through the grapevine that she was pregnant. For the fear of placing his wife and the pregnancy in danger, he chose to keep his terminal illness a secret and decided to move to a designated area in the mountains that he grew up in spending his last moments of life alone by himself. Using the precious moments he had left, he had he decided to write letters to his children (twins) whom he never got to hold, hear or see, and his wife who he deeply loved. Even with the problems they shared his love for her never changed; it only grew as he shared his most intimate thoughts and emotions on paper and in turn made peace with himself. I found this book to be very heartwarming, informative and motivational. This book is packed with touching stories from his personal journey in life. He shares touching stories and through his inspirational words and philosophical viewpoints he was able to take this traumatic obstacle that crossed his life path and use it as a motivator to grow and create positive change that would affect the lives that surrounded him forever. The Legacy Letters is filled with filled with fabulous stories and poems that share insight on how to cope, love, forgiveness and how to appreciate life and the little things we take for granted. As I read each detailed letter, I could visualize him. It was like he was in the room sitting in an old pine chair sharing his stories, insights, and words of wisdom with the world. The Legacy Letters helps you understand with his words of wisdom that a journey of awakening does not require a traumatic event to occur in order to experience a rude awakening. His letters in the book give the reader an understanding that as long as you are open for guidance then guidance will make its way into your life. His letters give you the opportunity to renew your relationship with your loved ones as he provides excellent spiritual guidance in this astonishing book, The Legacy Letters. In the middle of the book on page 76, he shares some insights, a little about himself and a beautiful poem that makes you appreciate all the little things we are blessed with that we take for granted. His letters taught me through his wisdom of words how to accept the negative things that occur in our lives and use them to empower us to make positive changes in our lives that will help us live in the moment and appreciate the life we live and the air we breathe. These letters look at life differently in a positive manner. Not only does this book share heartwarming stories, it will transform your entire life as you read this astonishing life changing book. I highly recommend this book for any adult or teen. This is a great book to read by the fireplace or in the great room with your family and it is excitingly packed with outstanding advice, stories, and spiritual guidance. I found The Legacy Letters a rewarding, motivating, inspiring and an enjoyable read.